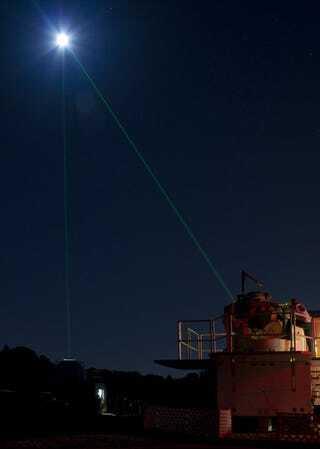 As part of Saturday's International Observe the Moon Night, NASA fired a ton of lasers at the moon. They weren't declaring war on alien life form, or trying to melt the cheese, but instead tracking the Lunar Reconnaissance Orbiter. NASA can locate the orbiter by shooting 28 laser beams every second at it, and while it's moving at 3,600 miles an hour, and is 250,000 miles away from Earth, it's still not too fast for NASA's humble laser unit at the Goddard Space Flight Center's Laser Ranging Facility over in Greenbelt in Maryland.